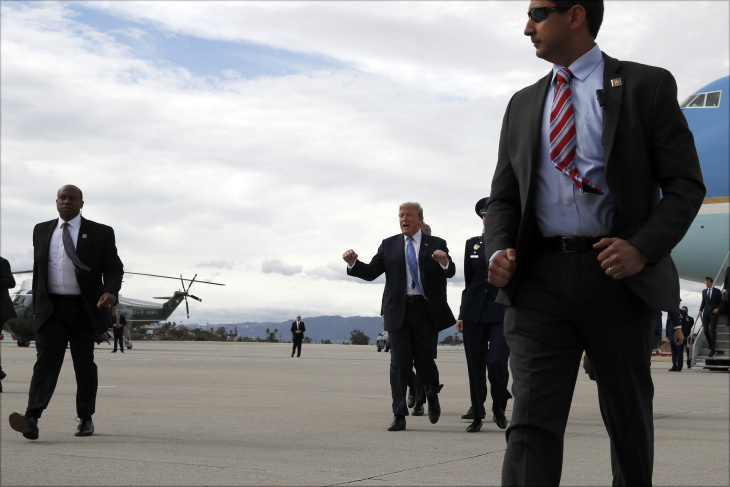 President Donald Trump landed in L.A. this afternoon after a stop in Calexico, and is reportedly attending a fundraiser in Beverly Hills. As is tradition, his visit will completely disrupt traffic in the areas he's slated to pass through. The area around Bundy Drive between Airport Avenue and West Pico Boulevard: closed between 2:30 p.m. and 3:30 p.m. The area around Sunset Boulevard between South Sepulveda Boulevard and North Hillcrest Drive: closed between 3:00 p.m. and 4:00 p.m. and again between 6:00 p.m. and 7:00 p.m. The area around Bundy Drive between West Pico Boulevard and Airport Avenue: closed between 6:30 p.m. and 7:30 p.m.
Foothill Drive, Elm Drive and Maple Drive between Sunset Boulevard and Elevado Avenue: closed between 1:00 p.m. and 7:00 p.m.. If you live in this area, someone will be available to let you in. Sunset Boulevard between Foothill Drive and Hillcrest Road: closed from 1:00 p.m. to 7:00 p.m.
After landing at LAX from Calexico shortly before 4 p.m. [Report from plane called an "uneventful flight, the highlight being when the pool [reporters] spotted the iconic Hollywood sign from the air," Trump flew by helicopter to the Santa Monica airport, sparing at least some traffic woes. There's a traffic-related to a hotline set up for anyone living in or traveling through Beverly Hills: (310) 550-4680. Godspeed to all of you traveling through the area. Maybe listen to a podcast while you're stuck there? Meanwhile, earlier today road closures went up around Trump National Golf Club Los Angeles in Rancho Palos Verdes. Golf staffers told people they were turning away that they'd been told it was for a "film shoot." The Washington Post is reporting Trump will dine at his golf course tonight with his son Eric and others. I'm here at @TrumpGolfLA where they're starting to shut down roads into and around the park. Demetrios Wilson was stopped from hiking on the nearby trails this afternoon. He had the worry shared by many veterans of presidential visits: horrific traffic. Particularly as there's only one main road in and out of Palos Verdes. "Obama would come to the Westside of L.A. on a Thursday, and create the most insane traffic you could imagine," said Wilson, who works at UCLA. Pat Duffy, who lives near the golf course, thought Trump's visit was great. "He's a tourist, right?," Duffy said. "So he comes over here, spends a few bucks, - what the heck? Everybody's dying for that." Wilson had a different view of the presidential stopover. "They all come to pick up checks," he said, referencing not only Trump but his predeccessors who made far more freqent trip to Southern California. "That's probably what he's doing." Emily Elena Dugdale contributed to this report from Palos Verdes. 5:15 p.m.: This article updated with Trump's arrival in L.A. and other details from a pool report. 3:57 p.m.: This article was updated with more road closures. 3:44 p.m.: This article was updated with more reporting from Palos Verdes. This article was originally published at 12:44 p.m.